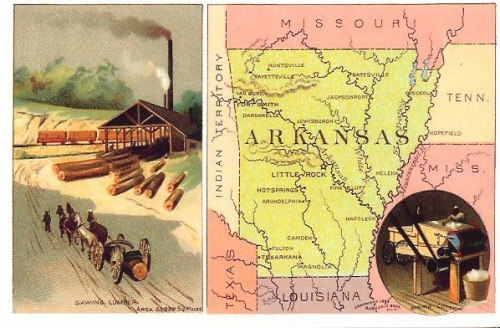 Arkansas Reproduction Vintage Postcard – Text on Back: Known as the Natural State, Arkansas is famous for its natural scenic beauty, clear lakes and streams, and abundant wildlife. The Territory of Akrkansas was admitted to the Union as the 25th state on June 15, 1836. The capitol and most populous city is Little Rock. Its state bird is the Northern Mockingbird, and its state flower is the Apple Blossom.